​For decades El Salvador has become one of the most impressive surfing destinations in Central America. Its main characteristics are the easy access to the beaches by any kind of vehicle, and the concentration of the surf spots in La Libertad area, with about 8 well known surf spots in a range of about 30 kms. of coastal road, plus other surf spots that not many know about. The International Airport of El Salvador is located in the central zone on the coast side. About 30 minutes away by car from La Libertad, so tourists traveling by plane can be inside the water catching waves just minutes after landing in the country. The most important surfing destinations are in La Libertad area, and in a couple well know surf spots in the east side of the country. Tourism is one the pillars of the economy of the country. And the development of the sport in different beach communities has helped them to innovate and create job opportunities, as well as bringing education programs and long term projects in beaches such as Playa El Tunco, Playa El Zonte, and Playa Las Flores, which now have manage to initiate a microeconomic business model that brings hope of growth for years to come. La Libertad is the surf capital of the country, mainly because, according to experts, it has the best waves in the country. There are many right point breas in the area, as well as a world wide recognize right that has hold a few international surf competitions. Possibly the most popular and most visited beach village in the country, it's a touristic destination par excellence. The development of surfing has made this place perfect for those beginning in the sport. Only 20 km from La Libertad town. Accommodations for different budgets are to be found here. 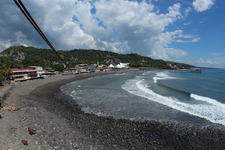 El Zonte is one of the most popular destinations for surfers from outside and inside the country. Located in the east part of the country, just a few minutes away from the small village of El Cuco in the Department of San Miguel. This artisan fishing village has become one of the most popular surf destinations in the surfing world. Situated at kilometer 59 on the coastal road, this place is ideal for surfers looking for a quiet village away from bars and restaurants. There are hotels and hostels available, but the access to K59 is limited to 4x4 vehicles. A great wave to improve the surfing speed and technique. This stunning beach is located in the Department of Sonsonate. The wave is very good and the crowd factor in the beach break side is very low. There are a couple accommodation options in front of the beach. Certificated Surf Instructors say that almost everyone can learn how to ride a wave and to surf. The opportunity to surf various surf spots along the country are available. Specialized guides offer surf tours to international visitors no matter in which surfing level they are. Access to different surf spots by either car or boat. A new way of enjoying inside the water that is becoming very popular. Rental of SUP equipment and lessons are available. 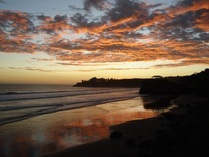 Located in Playa El Tunco. Reasonable accommodation rates in a quite atmosphere. Ideal for surfers, and those who want to learn how to surf and then rest peacefully after each surf session.